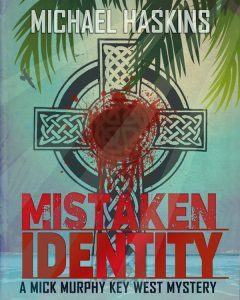 When Murphy’s friend is murdered he goes there for the funeral, only to be cooped by Norm in an DEA-GARDA (Irish police) sting that leads to violence & death. Back in Key West, Murphy & his collection of miscreants discover the troubles in Dublin have followed him to Key West. Bodies mount up as Murphy & friends protect themselves from Irish and Russian hit men out to collect the bounty on his head! Padre Thomas introduces a woman killer to the guys and it is assumed she’s after the bounty on Mick. To everyone’s surprise she turns out to be a lifesaver. Angel or devil, she is attractive distraction! Micheal Haskins was born in Boston and worked as a journalist before traveling San Juan, Puerto Rico for school and the California to work in TV broadcasting. He spent many summers in Tijuana, Mexico attending the bull fights with his many Mexican friends. In the late ’90s he moved to Key West to work as a journalist and then public information officer for the city. He now writes full time. He can often be found in one or two of the many local saloons that appear in his writing. “The island of Key West is as much of a character in my stories as are the mismatched characters,” he says.